Most people who know me are aware that I love spreadsheets and use them for many aspects of my life, most notably, personal finance. With how much time I have spent developing these financial spreadsheets, I think that it would only make sense to allow others to benefit from them as well. I will be adding on as time goes on, so check back frequently. NOTE: All of my spreadsheets are composed in OpenOffice 3.1. If you are using a different program, there may be some formatting and/or calculation issues. I have not had a chance to test these in excel yet. I recommend making a copy of each file after download to ensure that if unrecoverable mistakes are made, there is a source copy available to start over from. This spreadsheet is a great tool to see how much the ACA program (Obamacare) expects you to pay for health insurance. This spreadsheet will calculate out your percent of the federal poverty level and from there determine what amount the ACA expects you to pay for insurance per year. Your subsidy will be based on the difference between this number and the cost of the second lowest cost silver plan. This spreadsheet then compares 14 different changes in income situations to demonstrate how the ACA plan handles an over payment and an under payment of tax subsidies throughout the year, and how much of a refund/ repayment you would need to make. Additionally this sheet will calculate out the penalty owed for not having health insurance. 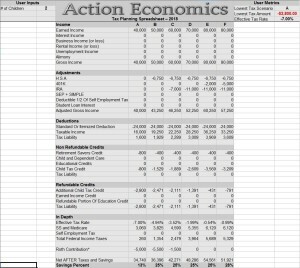 This spreadsheet is a great tool for estimating your liability and goes hand in hand with our tax planning spreadsheet. The ACA spreadsheet is currently a free download. House Payment Spreadsheet Version 3.0: Looking to Pay off your mortgage early? 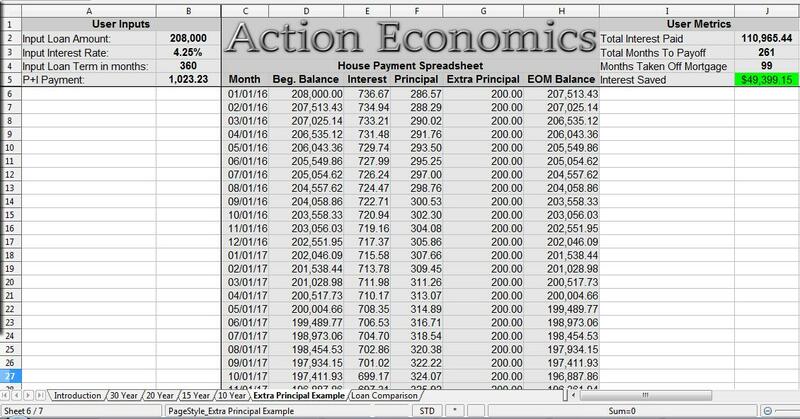 Check out our newest version of the House Payment Spreadsheet. This sheet offers everything our previous version did, with some really cool new features. For starters, the user inputs, which would be your loan details, are frozen in place, so no matter where you are in the amortization, you can see the details of the loan. The second big feature is the user metrics section. Like the user inputs section, this is also frozen and will travel with the entire screen. The user metrics section tell you how much interest you will pay over the life of the loan and calculates in any additional principal payments you make and tells you how many months you have taken off the mortgage and how much interest you have saved. I personally love this feature and my need for this feature is why I created version 3.0 of this spreadsheet. Paying off a mortgage is a lot of hard work and you don’t see any real results until it is fully paid off. The user metrics provided by this spreadsheet provide a HUGE motivational boost. For me I was blown away to see that so far I have saved over $16,000 in interest and taken over 4 years off my mortgage! I love seeing how much money and time I am saving with each payment I make on my mortgage. Tax Planning Spreadsheet for 2018: This is the new and updated spreadsheet for tax year 2018. 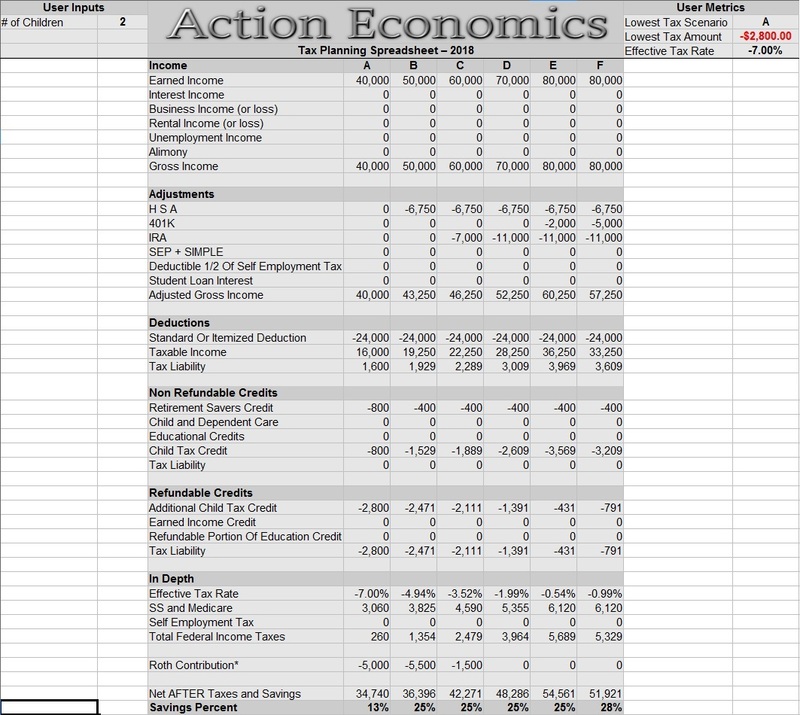 All adjustments made to the tax brackets have been inputted into this spreadsheet. I have redone the 2018 spreadsheet to also include a user metrics section to display which option has the lowest tax bill, and what the effective tax rate is. Another major change for this year is a reduction in the total number of comparisons. The old sheet seemed too cumbersome with 10 comparison columns, this version reduces the number of columns down to 6. This is what you want to use for planning out your taxes that are due April 15th 2019. Click here for a video overview of the spreadsheet. Retirement Planning Spreadsheet: This spreadsheet has been completely reworked to make it much more user friendly than the previous version. This retirement planning spreadsheet allows the user to input different contribution amounts for each year and to compare different retirement scenarios side by side. In the user metrics section the spreadsheet will show the user when they will reach their retirement nest egg goal and when they will become a millionaire. Additionally this spreadsheet will also calculate the users Social Security benefits provided their Averaged Indexed Monthly Earnings. Budget Spreadsheet: I make spreadsheets for things that I see a need for. 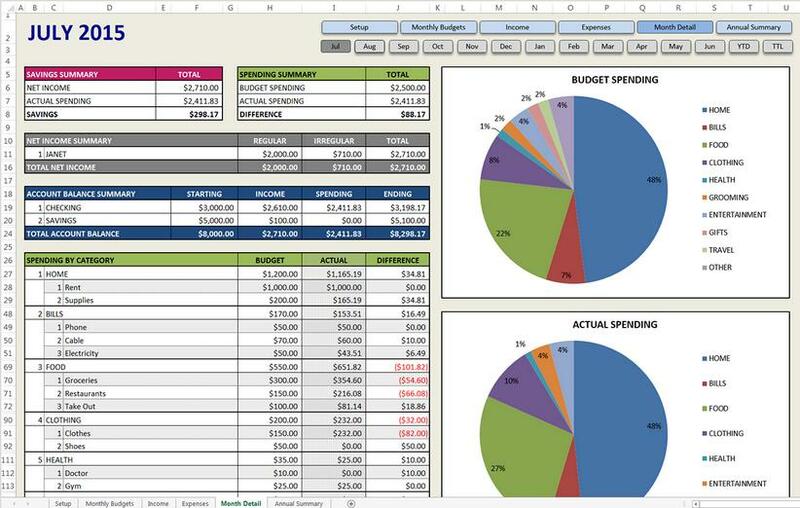 While I think a budget spreadsheet is very useful there are already great budget spreadsheets available, that are honestly better than anything I could build. 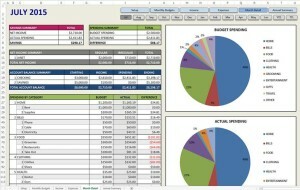 Savvy Spreadsheets has multiple excellent budgeting spreadsheets available. The Super Deluxe Budget Spreadsheet allows for up to 20 expense categories and will generate pie charts breaking down your budgeted spending next to your actual spending to keep a good handle on your finances. NOTE: I am not a tax accountant or a professional in any financial sector. These tools are estimation templates to assist YOU in making your decisions. While every effort has been made to optimize these sheets for a wide audience, I am human and mistakes may exist. While I think these are excellent products, they are essentially just a framework for you to play with to find out what may work right for you. Please contact me with your thoughts on my spreadsheets and any improvements or adjustments you think I should make. 2 Responses to "Financial Spreadsheets"
Hey, I’m glad I found your blog! We’re in a similar situation financially and I appreciate you putting out what you’ve learned for others in the same boat! I’m playing with the sheets and on the Tax Planning 2018 sheet, I think there may be a formula error? On “Married Joint” on D39, it looks to be using =SUM(D36:D38) when it should be using =SUM(D33:D38). Also, I’m a bit confused on the Retirement Planning Income Goal page. With a larger withdrawal percentage, wouldn’t you need a larger retirement goal? I’m not sure what this page is trying to show. Oops! Thank you for letting me know about the calc. error. I will get that changed shortly. On the retirement planning spreadsheet the ‘Income Goal’ sheet is designed to show how much total savings you need based on what percent of the total you are withdrawing per year. The larger withdrawal rate you take the higher the risk is that your portfolio may end up running out at some point, or not grow as large. With a larger withdrawal percentage you will need a smaller nest egg to meet the same desired income stream. As an example, if you want to withdrawal $50,000 per year using a 5% withdrawal rate you would need $1 million. If you were using a 10% withdrawal rate, taking out 10% of the initial balance per year, you would only need $500,000, however your risk of running out of money would increase substantially.